Another great event here on our doorstep! 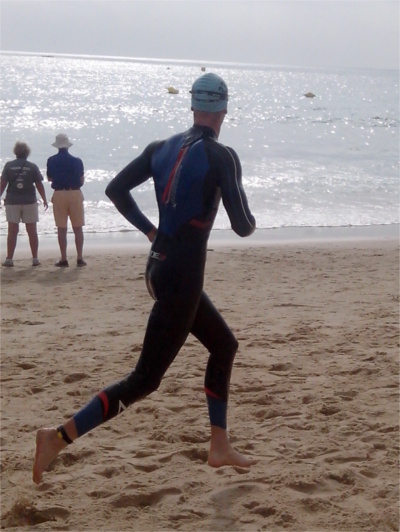 Triathlon is really catching on here in the Algarve. I did an Olympic distance triathlon yesterday, and have to say, it felt really easy after the half ironman distance Challenge Paguera last week. It’s another step in the long process of learning about this sport. The race was in a beautiful place. Martinhal is a lovely beach on the south coast of Sagres with a couple islets about 300 m out to sea. I hadn’t actually been there before (that I can remember). The swim course was fantastic, everyone was commenting on the fish and rocks on the bottom -usually you don’t see anything in the water. A cross current made interesting. I missed the main ‘train’ right at the beginning of the swim after I spent about 150 m just swimming up and round a big group and chasing the trio up front; I couldn’t quite bridge the gap. I swam along with someone I guess must have been in one of the relays. She was pure swimmer. It was a cool learning experience to pace off someone and vice versa. The cyclist in came out at one point when I put in a dig to try and drop here. All in all I lost 2′ in the swim to Igor Guerreiro whom is coached by Ricardo. Ricardo himself had a good race in the sprint distance race. He won race after he managed to put 2′ into his closest competitor in the swim and holding on through the rest. I wasn’t biking very well. But I am a ‘cyclist’ and it was non-drafting, so I took a big lead on the bike. After three days running long distances with a fantastic group from Denmark, to say the legs felt “a bit tired” was an understatement. Also I didn’t touch the bike in a week. Not that feeling of oomph I used to get as a cyclist. I think it’s the running, or not being able to train sufficiently, but triathlon ‘robs’ at least 10% off top potential on the bike and accelerations and sprints become harder to do well… It’s like you can feel the potential is there, but can’t unlock it. I think the impasse is neuro-muscular; i.e. changing the muscle activation pattern for one sport to the other doesn’t allow the nervous system to recruit quite many motor units, rather than a lack of potential at a respiratory level. Ricardo wins the sprint, I win the Olympic! When I did the mountain biking a few years back I used to go with a couple of friends and out basis for voting whether an event was good or bad was the quality of the lunch: By that ranking system this was probably the best triathlon in the world! The resort put on an amazing spread afterwards. The organisation, while not faultless, was excellent. The course was well marked out and the volunteers very helpful. The main gripes were the security in the transition area and a lack of carpet to it from the water; not that I minded particularly, others did. 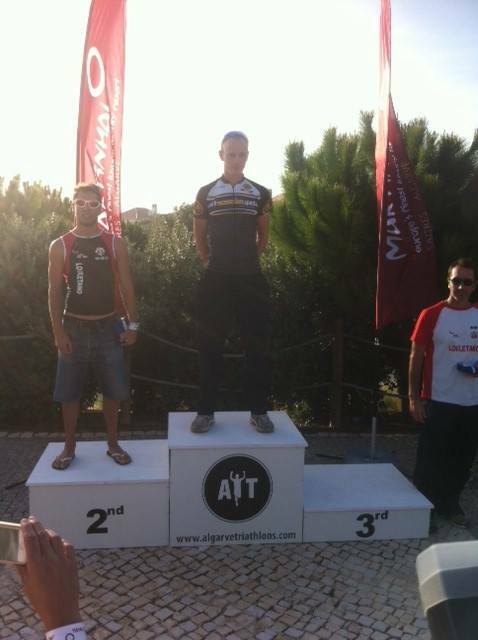 Congratulation to Algarve triathlons on a great event, hope there are many more to come! Anyway, that’s first win in triathlon and more importantly, I’ve improved. Next I’ve got the ‘bridge run’ or ’10 milhas do Guadiana’ from Spain to Portugal or vice versa (if the foot holds up) it’s quite long (17 and a bit km) and I did it about 4 years ago while still a cyclist in 1:14… So I should go a bit quicker now! Sub 1 h might be a bit optimistic, but I’d hope to get round the hour mark. 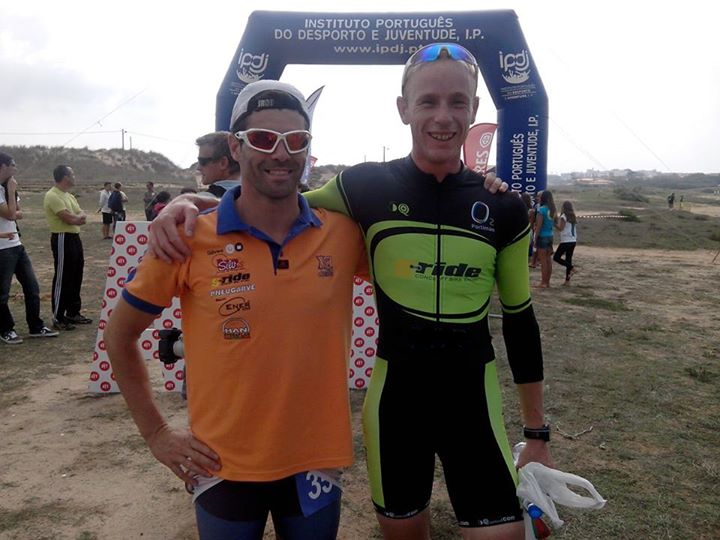 After that it’s a Duathlon in Castro Marim the following week… Might be fun to cycle there and do it. Training wise I’m going to up the ante a bit… It’s going to be hard to get the discipline to do it correctly.